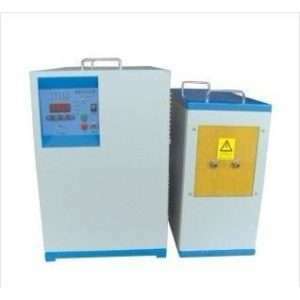 The high-frequency precious metal melting furnace relates to the field of precious metal melting furnace, in particular to a high-frequency precious metal melting furnace, which solves the problem that the two included angles between the inner bottom surface and the inclined surface of the existing noble metal high-frequency melting furnace body are at right angles and the discharge port The discharge end is a cone-shaped and has many defects, including the furnace body, the furnace and the electric heating induction coil, the material outlet is arranged above the furnace body, the inner side of the furnace body is inclined and the angle α with the vertical direction is 4 ° 30 ‘ ~ 6 ° 30 ‘, the inner side of the furnace and the bottom of the angle at the arc transition, arc radius R is 4 ~ 8mm, discharge port of the discharge end of a smooth arc. When the furnace is manufactured, the quality of the demoulding is improved, the demoulding time is accelerated, the damage of the inner corner of the furnace in the demoulding process is reduced, the residue of the feed liquid is avoided during the reflow, the design of the discharge outlet is effectively controlled, and the dumping of the material flow is effectively controlled When the form, to avoid splashing, in short, simple structure, reasonable design, lower production costs, with some promotion and application value. High-frequency precious metal melting furnace In the precious metal manufacturing industry, the quality of precious metal products is an important factor in determining the value of the product. Due to the special nature of precious metals, to produce high-quality products, the quality requirements of precious metals is very high. At the same time, due to the high value of precious metals and the high costs involved, the research and application of smelting technology processes in the processing of precious metals is very important for the precious metal manufacturing industry. It is known that medium and high frequency melting furnaces are commonly used equipment for melting steel, iron, copper, aluminum and various alloys. The structure of the existing high frequency melting furnace mainly comprises a furnace body and a furnace body in the furnace body, Heating the induction coil, the upper end of the furnace body is provided with a discharge port, and the angle between the inner bottom surface and the side surface of the furnace is a right angle, that is, the shape of the furnace chamber is cylindrical. Mold a long time, during the demolding process can easily damage the furnace angle, affecting the furnace molding, the second is the melting furnace liquid body after pouring precious metal into the mold, the bottom of the furnace easily left material; Furthermore, the existing furnace above Discharge end of the discharge port is tapered, and the furnace wall convergence is not smooth enough, resulting in dumping material form is not ideal, material flow control difficult to disperse, easy to splash. In order to solve the problems that the two angles of the inner bottom and the bevel of the existing noble metal high-frequency melting furnace body are right angles and the discharge end of the discharge port above the furnace body is pointed conic, A high frequency precious metal melting furnace is provided. The high-frequency noble metal melting furnace is realized by the following technical scheme: the high-frequency precious metal melting furnace comprises a furnace body, a hearth in the furnace body and an electric heating induction ring arranged on the outside of the furnace body, The utility model has the innovation point that the inner side of the furnace is bevelled and the angle a with the vertical direction is 4 ° 30 ^ 6 ° 30; the angle between the inner side and the bottom of the furnace adopts arc transition and the radius of arc R is 4 ~ 8_.